If you're unable to restore System Image in Windows 10/8/7 due to "The system image restore failed. The parameter is incorrect. (0x80070057)", fix is here. If you don’t System Restore points created on the machine and you want to go back to earlier stage, System Image is useful recovery option in that case. But sometimes, you may find that System Image restore might fail to work with some arbitrary error. If you’re new to Windows, check this guide to create System Image backup and this guide to restore the created backup image. 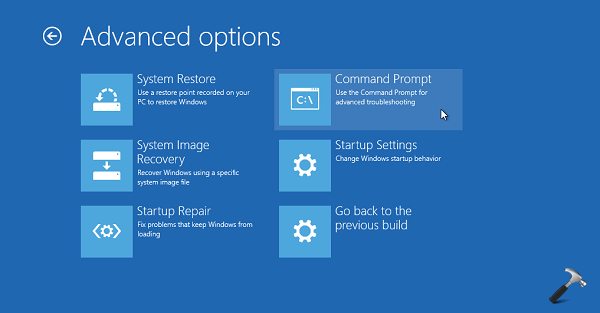 When System Image restore failed and you don’t System Restore points, you may opt for Refresh or Reset. If you’re afraid about losing your data, you can try in-place upgrade instead. However, if you’re on any older OS such Windows 7, you may be left with clean install as the only option. In such a case, restoring System Image is your highest priority. Hence you can try below mentioned solution and see if it works for you. You’ll require System Recovery Disk or Windows installation media to follow this. 2. Last step will result in opening of Command Prompt at boot. Select your admin account and enter your select account password to continue.